Success! 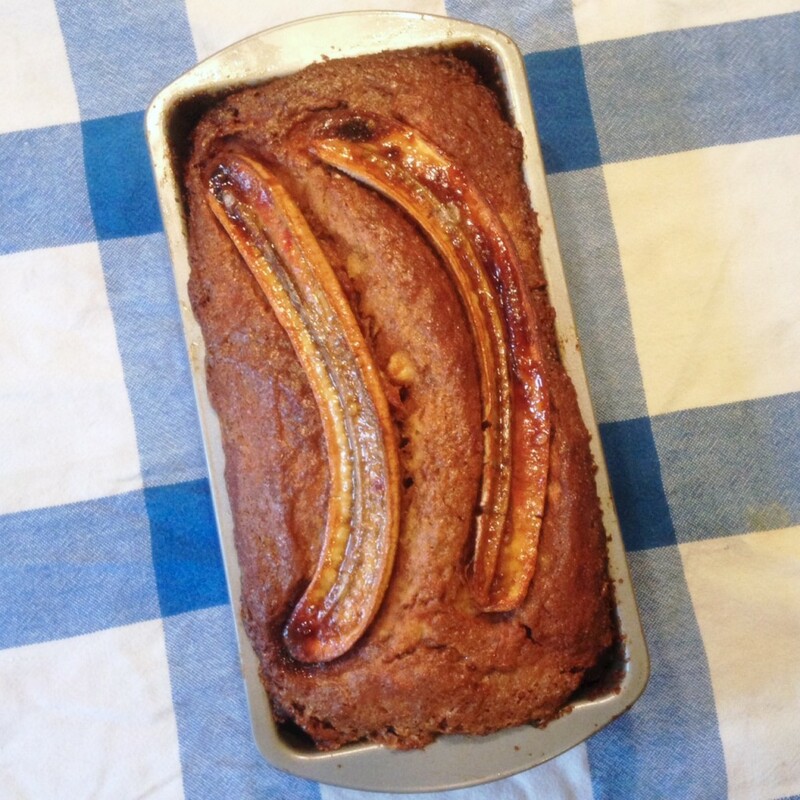 After about two failed loafs I have now cracked a gluten-free recipe for some tasty banana bread. I’ve been experimenting with my own mixture of cornmeal, rice flour and almond flour but the results were too firm and too dry. So I caved and bought some Dove Farm white flour and tweaked my recipe accordingly. I’ve definitely just eaten a slice and it’s really yummy! So I can finally post it up. To make things even better, in my supreme efficiency (or let’s be honest: laziness) it’s all just 1 pot and so fast to knock up! So if you have a stand mixer, don’t even bother mashing the bananas, if you’ve only got a hand-held one, maybe mash them up a bit with a fork. Oven onto 170°C. In your mixing bowl put the flour, baking soda, cinnamon and salt in. Stir these dry ingredients up a bit. Then add the vanilla essence, butter, light brown sugar, eggs and 5 bananas (remember to set one of the 6 aside). Now turn the mixer on low to medium speed and prep your bread pan. Butter the pan thoroughly and place a greaseproof sheet at the bottom. The mixing should be done now so pour in your batter. Slice lengthways your banana for decorating and place on top. In a small bowl mix the 2 tbsp of dark soft sugar with just enough hot water to dissolve it all. With a pastry brush, carefully wash the top of the raw batter mixture and banana with 2/3 of the sugar mix. While this bakes it should turn into a crunchy caramel topping. Bake for 60-65 mins, or until a skewer comes out clean. In the final 5 minutes use the remaining sugar wash. Leave the banana bread in the pan for another 10-15 minutes before removing and it should come out really easily after you go round the edges with a knife. I couldn’t help but try a still warm piece straight away! Honestly, fastest bake to blog post ever. There are times when the evenings are too cold in London, work is too stressful and I just feel a bit homesick and really miss Hong Kong. At times like these, it’s always that taste-of-home-like-mum-makes-it which really hits the spot. This particular dish is a Cantonese staple and a huge favourite of mine. It’s salty, saucy and you have to eat it with rice. The lotus root is a vegetable that has starchy potato like qualities whilst also keeping a satisfying bite, and the fermented tofu sauce has a strong umami flavour. I’ve read that it’s been likened to cheese, but I guess it’s just one of those things that I’ve eaten from childhood so it’s just fermented tofu flavour to me. So first things first you’ll probably need to get your mitts on some fermented tofu (紅腐乳) from your local oriental supermarket. There are also dried mushrooms in this dish, so you will need to pre-soak these in a bowl of water with another bowl stacked on top to fully rehydrate them for at least an hour. Cut the pork belly into 2-3 inch chunks. Set aside. Peel the piece of ginger and with the large flat side of a meat cleaver SMASH IT FLAT, peel the garlic and repeat the smashing (if you don’t have a big meat cleaver, a meat tenderiser is fine). 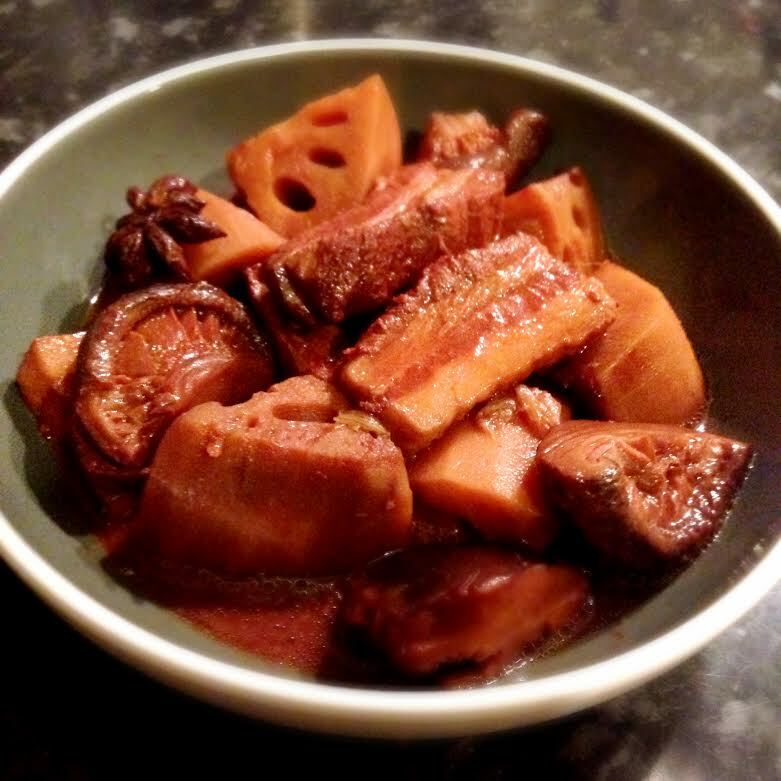 Peel and cut the lotus root into similar sizes to your pork and give the occasionally large piece a similar smash with the side of the cleaver (violent hey? Good for de-stressing this). My mum tells me it’s to get more flavour in, I think she just likes smashing things. Rinse off the lotus root and add leave them in a container full of water and a bit of salt to stop them from discolouring. You now want to make a simple marinade. In a separate mixing bowl (large enough for all the pork) add the light soy, dark soy, rice wine, sesame oil, salt and sugar. Stir thoroughly and set aside. Get your wok on medium to high heat and when the wok is nice and hot add your vegetable oil, once this is piping hot add the ginger then the garlic and flavour that oil but be careful not to burn the garlic. Remove the garlic and ginger and set aside. You now want to sear the pork belly, it’s okay not to thoroughly cook it at this stage as it will go through a lot of braising, just carefully brown each side of the pork. Once this is done, remove the pork and place it in the marinade, coat evenly and set aside. With your wok still on, add back the ginger and the garlic and stir fry until fragrant again. Add to this the mushroom halves. Once they start smelling lovely add the fermented tofu with a cup of water and use the wok spatula to flatten and mix the blocks into a paste. Sieve the lotus root from the water and add the root to the wok. Stir stir stir. Coat coat coat. Now add the pork belly and all the marinade from the bowl. Finally add the star anise and enough water to just coat everything. Take the heat down to a simmer and leave for 2 hours always making sure to stir everything up occasionally and top up the water if needed. Test the pork, once this is soft and tender you’re ready to go. I hope you made some rice with that.